The global market for healthcare transportation Services valued at $79.43 billion in 2017 is anticipated to grow at a CAGR of nearly 4.2% during the forecast period. Hospitals are estimated to be the largest market for global healthcare transportation growing at a CAGR of 4.91% with $37.2 billion in 2017.The Major factors driving this market comprises of increasing emphasis on improving healthcare system, growing need for quick transportation of samples and specimens for testing and increased focus reducing logistics cost. What is Healthcare Transportation Services? The Healthcare Transportation is a set of systematic process by which health related critical material are transported to and from various location within the healthcare system. The Healthcare Transportation Services enable the convenient movements of patients, medicines, machines and samples & specimens for testing. What are the major end users of Healthcare Transportation Services? Many hospitals and healthcare providers are providing healthcare transportation services to the patients who require non-emergency healthcare transportation to get different healthcare services. In usual ridesharing model, large and more adaptable group of part-time drivers can boost their income when there is a demand and can shrink when there is no demand. On the other hand patients also will not miss their appointments. To maximum extent, this initiative will work out and offer benefit to the people under medical risk. Soon, Drones going to drop-down the medical kit and other stuffs in customer door steps. Researchers around the world come up with an innovative trend of making drones to carry automated external defibrillators to the sites of cardiac arrest cases faster than ambulances. Even a medical professional is not present at the site, when an AED carried by drone arrives to the spot, a non-medical professional can also go through the process of using it by his/her own hand. These drones are capable to travel even to places which are difficult for easy human access such as tribal and reserved areas. It is a dashboard which provides flexible solutions for healthcare professionals to pick rides for patients visiting to healthcare center’s they need. The dashboard is integrated with UBER Health API which provides information on healthcare products. Even a smartphone is not mandate to access the service, rather a text message is enough for accessing the nearby healthcare services. 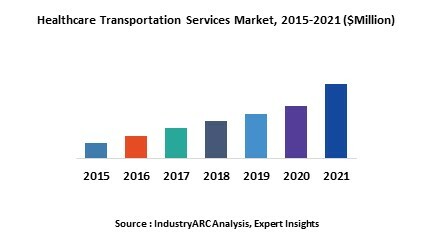 Who are the Major Players in Healthcare Transportation Services market? The companies referred to in the market research report include DHL Healthcare, ATS Healthcare Solutions., Xpress Non-Emergency Medical Transportation., Logisticare, American Medical Response., ProHealth Care., and other 10 more companies.